The woman is a mule in a drug trafficking channel from Brazil; the anti-mafia unit is ignoring the case, but the US DEA could make the next move. Bulgarian national Tsvetanka Evstatieva Todorova, 67, was detained with 700 grams of cocaine at the Zurich airport. She arrived from Sao Paolo (Brazil) on July 30 this year and was supposed to catch a flight to Athens and then get to Sofia by bus. During a routine check, however, the Swiss customs officers found the drug in her briefcase. Its price on the black domestic market in Bulgaria exceeds BGN 1 million. The elderly woman remains since then under pre-trial police arrest near Zurich, but so far, she has been refusing contact with the Bulgarian consulate in Switzerland. This was also confirmed by the Foreign Ministry, following an official request by Bivol. The Bulgarian authorities have been informed, but the prosecutor’s office and the Main Directorate for Combatting Organized Crime (GDBOP) have not done and are not doing anything on grounds they had no reason to think that an organized crime group (OCG) is involved as it requires the participation of at least three people. However, there is an organized crime group and Tsvetanka has good reasons not to trust the Bulgarian authorities. A complaint logged by her against brothers Mancho and Anri Kovachevi, both with criminal records, has been simmering in the prosecutor’s office in the northwestern city of Vratsa since the end of June. The document reveals that these thugs and loan shark are holding the woman dependent through a scam with her apartment. The brothers are part of a group including a convicted drug dealer, Yordan Tonov, and a local policeman who has become a sort of a media hero, an investigation by Bivol established. Today, they are walking around the city at large and undisturbed and are demonstrating a luxurious lifestyle while the elderly woman sits in a prison cell. In her claim to the prosecutor’s office, Tsvetanka describes a classic loan sharking property fraud. The woman worked for a long time in neighboring Greece and saved some money with which she bought a home for herself for BGN 45,000 with a mortgage that she had been paying off for years. While she was away from Bulgaria, she became indebted to the power utility, and, in addition, needed money to buy furniture. Banks, however, refused to grant her a consumer loan due to her small pension and uncertain income from abroad. This is when she turned to the loan sharks. To get a loan from the brothers, who own a pawnshop, she was forced to pledge her only asset – her home. Having spent many years outside Bulgaria, the woman had not been aware of Kovachevi’s true “activity”, of their long rap sheet and convictions for fraud, money forgery and theft and had no idea she was falling victim of yet another property scam. After taking the loan from them, Tsvetanka returned to Greece. From there, she regularly wired money to Mancho Kovatchev via Western Union because that was the arrangement with the brothers. When she retired and returned to Bulgaria, an unexpected shock awaited her. The elderly woman found out that she no longer owned her home. The fraudsters had made her sign a document for a sale, instead of a collateral one. Tsvetanka has kept and can provide all money transfer receipts that show that she had paid her debt to the loan sharks in full. To top it all off, Anri Kovachev told Tsvetanka that his brother Mancho had nothing to do with the loan, that is, he did not at all consider the money she wired from Greece to be installments because he, himself, had not received anything from her. The victim was informed that not only she had not paid off her debt, but it had grown from BNGN 5,000 to BGN 12,000. Tsvetanka then logged the complaint and sought in vain help from the prosecutor’s office. Tsvetanka’s grandson – Iliyan, who approached Bivol, tells what happened next. The grandson is Tsvetanka’s only care and hope. He is very connected with his grandmother and perceives her as his second mother. Iliyan was abandoned by his divorced parents at an early age and grew up in orphanages. His mother’s grandmother, Tsvetanka, was the one to take him out of there. They have been living together for many years and continue to do so. Tsvetanka took him with her to Greece, where Iliyan also worked after becoming a young adult. Iliyan has no doubt that his grandmother was recruited as a “mule” by the two brothers against a promise to get back her apartment seized through fraud. Iliyan even claims that his grandmother may have been drugged while signing the paperwork. This is what she says in her claim to the prosecutor’s office as well. However, the notary – V.V. – says that everything is in order. The threats against her grandson she had received from the thugs are probably another reason for Tsvetanka to agree to become a mule and a hostage to the drug dealers. After Tsvetanka disappeared, Iliyan met with Anri, and according to Iliyan’s words, the meeting had been also attended by former policeman Tsvetan Blagoev and by Nikola “The Gypsy” Georgiev. The latter is infamous in Vratsa and the region as an emblematic underworld figure. As the Kovachevi brothers, he is a well-known loan shark, but there is evidence that he accepts “wet” orders and is known to be using force. After Iliyan learned that his grandmother is in a Swiss prison, he had been threatened to keep his mouth shut and noticed that he is followed. “The Gypsy” was sentenced in 2009 to two years and ten months in prison for participating in the organized crime group of Yordan “Dancho the Buck” Tonov for illegal drug distribution, human trafficking and prostitution. However, Nikola Georgiev and two other members of Tonov’s gang reached an agreement with the prosecutor’s office and received under the minimum sentences. According to Bivol’s insider sources from the police, wishing to remain anonymous, the four are very close and enjoy high-level protection from people in the Ministry of Interior and GDBOP in particular. There is confirmation of what Iliyan told us about Kovatchevi’s warm ties with former policeman Tsvetan Blagoev – he is the same police officer, who filed a signal against the director of the Regional Directorate of the Ministry of Interior in Vratsa and over this move was consequently turned into a hero by TV reports. 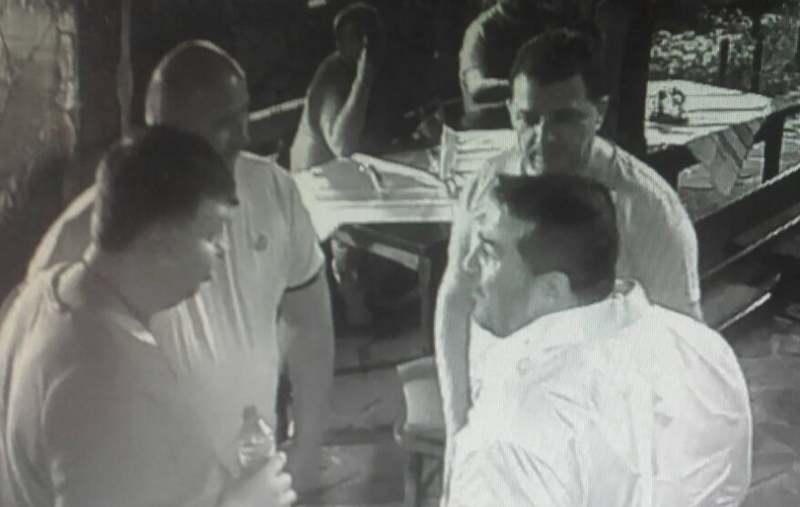 Police officer Tsvetan Blagoev, Nikola “The Gypsy” Georgiev and Mancho Kovachev at Mancho’s birthday party on May 4, 2017. Photos that Bivol has in its possession, show Blagoev, the brothers Kovachevi and “The Gypsy” in an intimate conversation at the birthday party of Mancho Kovachev. On one of the photos Tsvetan Blagoev and Mancho Kovachev are seen in a friendly hug. Approached for comment, Tsvetan Blagoev said it was a setup and he accidentally met the group while smoking on a terrace. He only knew and communicated with Anri, while he “could not stand” his brother Mancho and “The Gypsy”. According to Blagoev, he personally contributed to sending Mancho to jail years ago. Mancho Kovachev (with the mustache) is intimately hugging Tsvetan Blagoev. The case with Tsvetanka is not a precedent. This is an organized criminal group that has acted in the same manner with many other “debtors” turned into hostages in Northwestern Bulgaria. Orphan Dilyan Tsanov disappeared after a similar property scam. The boy is the sole heir of deceased parents and can claim a home that the gangs acquired through fraud and then sold. At the moment, it is even unknown whether he is alive. In that case, however, unexpectedly the entire municipal administration was also deceived as the apartment turned out to be municipal property, but has been resold on paper many times by the missing boy. One of the people questioned during the investigation was Anri Kovachev, but the case was closed because orphan Dilyan Tsanov disappeared without a trace. Iliyan is currently in a safe place and would speak only to a truly independent and unbiased investigation if he is guaranteed safety and security. This is not possible in Bulgaria and the hopes remain that justice will come from abroad. The fact that nobody is currently investigating Kovachevi for drug trafficking is indicative. The Bulgarian “anti-mafia” police continue to completely ignore the signal from Switzerland, despite serious indications that this is a well-organized, serious drug channel for which there are reasonable doubts and testimonies that Kovachevi and their group are playing a key role. Bivol’s insider sources say that Tsvetanka Todorova has described in detail who, how and in what way has forced her to commit the criminal act and has named the organizers and leaders of the criminal group. And this is because Anri Kovachev is a proxy of the American company Balkan Properties Corp., registered in the state of Delaware, according to a check by Bivol in the Trade Register. In 2010, the company became the owner of Bulgarian Balkan Properties 2 and Kovachev was appointed its manager. Anri Kovachev represents a US company. A channel for illegal drug trafficking from Brazil with a Bulgarian mule, Bulgarian ringleaders and an American company – this all reeks of an explosive mix that can end with dozens of years in jail in the United States. And, from the average Vratsa thugs, such an investigation can lead to their patrons and the key leaders of this criminal activity in the country, including the officials who use to protect them.